RSW chillers are easily fouled or blocked up by scales, seaweed or just about anything else that can be brought up through your seawater pump. 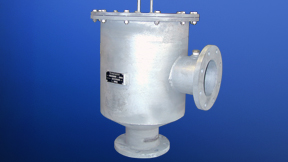 RSW strainers from Teknotherm can prevent fouling by stopping debris from ever reaching your chiller. We manufacture our strainers locally with the same level of craftsmanship you find in all of our products. These all steel units are hot-dip galvanized to maximize corrosion-resistance. Each one is designed and manufactured at our complete fabrication shop in Seattle, Washington. Cleaning is simple and easy: just backflush any accumulated debris back out of the strainer. Saves a lot of wear and tear on your chiller.